← 2nd Anniversary with WordPress! As we remember World War I and the victims of this war, poppies are a symbolism for the many millions of souls that perished. One of my earliest memories of this flower was when my Mother would receive a poppy from our local bank or grocery store on the day of remembrance and pin it on her dress – her way of acknowledging and remembering. 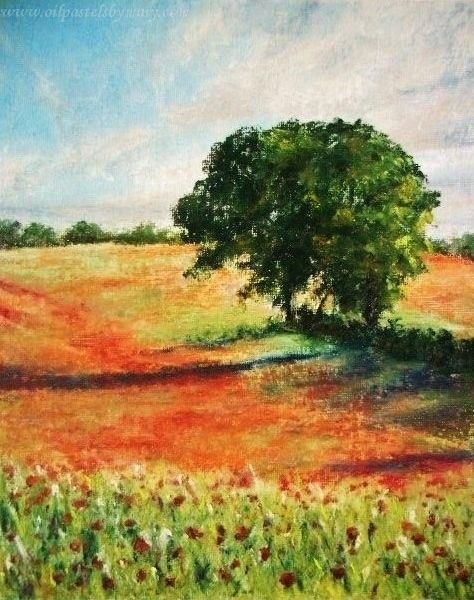 Here, my second version of a Poppy Field (#2), is a tribute and salute – this oil pastel (10×8) is of the same area that Poppy Field #1 was painted. 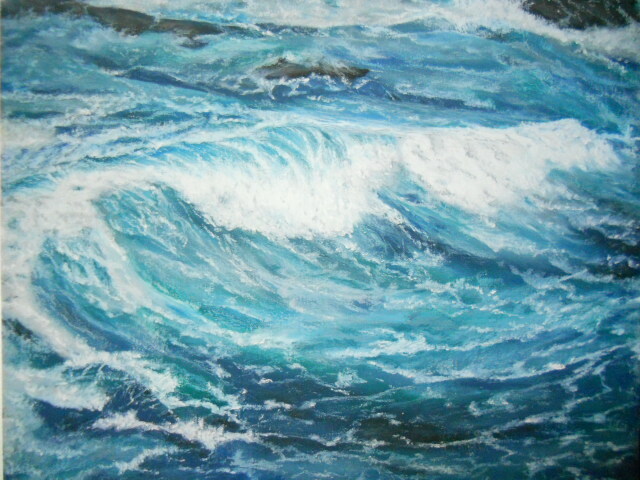 The painting was done on a gesso prepared artist canvas board, using mainly Holbeins, Senneliers and Neopastels brands. Thank you for checking in . . .
Reference image was from ESP of pmp. This entry was posted in About Oil Pastels, OPs New Paintings and tagged oil pastels, painting, poppies, poppy field. Bookmark the permalink. I am in love with your paintings!! Thank you Eva, what a beautiful compliment! A simple and yet mythic flower. Coming from France where WWI has left deep marks and living in California where the poppy is the state flower, this is a moving and lovely post acompanied of course by a beautiful art piece, as always. Thank you Evelyne really appreciate your thoughtful comment. Wonderful piece Mary and wonderful meaning. Thanks so much Tim. Hope you and the family have a wonderful weekend! Beautiful painting and perfect tribute. All of the elements work here so very well. The flow of the sky, shadow and fore ground complement each other. Add the color into the mix and this painting sings. What a beautiful comment Elena, thank you so much. Glad you enjoyed the piece – it looks nice together with Poppy Field #1, so I’ve decided to hang them together in the center hallway. Have a beautiful weekend. Beautiful flow of fields of poppies! Thank you so much Marina for your generous comments. Enjoy your week. Lovely and a wonderful remembrance. I think I prefer this, Mary ! – although were you to ask me why, I’d do a bit of mumbling. Thank you M.R. – reading that you like the painting is good enough for me. A sad day, Mary, but a beautiful painting. Thank you Jo and for your reminder. Thank you very much Elizabeth for your lovely comment. Thank you Rhonda, so glad you enjoyed this piece. The lone slightly drooping stance of the tree and the muted almost faded colouring of the poppies is very effective . Your poppy field is tinged with a subtle poignancy and all the more moving because of it Mary . Thank you Poppy – your descriptive words bring a grace to the scene that is not only a compliment, but a nod of knowing. Thank you so much. What a lovely post and wonderful memory. I didn’t know that about poppies. Your painting is wonderful, love the contrast colors between the tree and colorful fields. Hi Janell, thank you for your beautiful comment – I really appreciate it! Lovely sentiment and painting. My earliest remembrance of poppies is much the same as yours. As acknowledgement I still get a poppy every November 11 and wear it with respect. Thank you Susan so much and glad you experience the same each year – I have not seen poppies handed out here as they are back East. Lovely just as the other poppy field, love that you payed tribute to all the victims of the World War I in such a lovely way! Beautiful canvass! Thank you Eva for your thoughtful comment, means a lot. Have a beautiful evening. Thank you so much Doris for your lovely comment and noticing the compliments. The color is just wonderful in this one, Mary…almost heartbreaking..
Wow Cynthia, this brings tears to my eyes – simply beautiful and fitting. Thank you for bringing such a moving poem that we can all appreciate the profound meaning. And thank you for the lovely compliment, my poppy fields are done for the year.